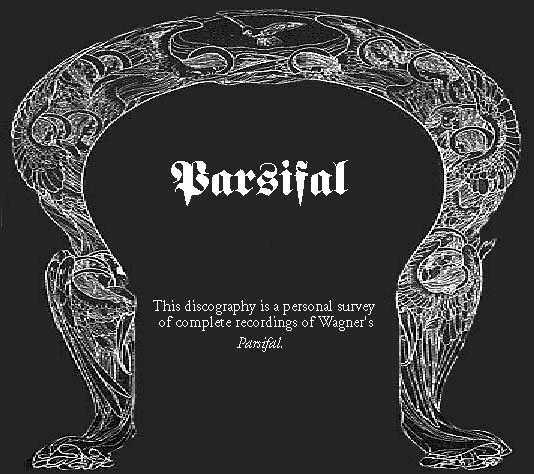 n the years since I first assembled this discography, so many complete recordings of Parsifal have become available that today it would be a significant undertaking for anyone to assemble a comprehensive survey. Therefore, although I shall make some additions to this list from time to time, I have no ambition towards completeness and it will remain selective. I hope that this personal survey will at least assist those who are overwhelmed by the choice of recordings to identify a few recordings with which to begin their listening. Levi 1882 1h47m 1h02m 1h15m. Fischer 1882 1h50m 1h10m 1h23m. Mottl 1888 1h46m 1h07m 1h22m. Seidl 1897 1h48m 1h04m 1h27m. Muck 1901 1h56m 1h07m 1h23m. Balling 1904 1h46m 1h03m 1h19m. Beidler 1906 1h48m 1h05m 1h18m. S. Wagner 1909 1h49m 1h09m 1h25m. Kaehler 1924 1h59m 1h08m 1h22m. Toscanini 1931 2h06m 1h12m 1h30m. Strauss 1933 1h46m 1h04m 1h18m. Von Hoesslin 1934 1h44m 1h05m 1h18m. Furtwängler 1936 1h52m 1h03m 1h17m. Knappertsbusch 1951 1h56m 1h10m 1h21m. 1936. Teatro Colón, Buenos Aires. This performance was recorded on 22 September 1936. Conducted by Fritz Busch. Teatro Colón Orchestra and Chorus, Buenos Aires. Chorus master: Rafael Terragnolo. Issued on CD: Ward Marston (info at marstonrecords.com). Notes:Transcribed from the original discs by Ward Marston, who writes: The performance was recorded on sixteen- inch, aluminum-based, lacquer-coated discs. Using two turntables running at approximately 32.8 rpm, the recording covers sixteen sides. I have been told that the recording equipment was located in the basement of the Colón and that three microphones were used, one above the orchestra, a second above the front of the stage, and a third over the rear of the stage. Unfortunately, the operator of this equipment did not know how to adjust the three microphones properly to achieve a comfortable balance between singers and orchestra. Throughout the performance, the engineer constantly changed the sound level and switched microphones on and off seemingly for no reason at all. The singers are, therefore, not always as audible as one would like them to be. Approximate timings (some breaks): Act 1, 1h37m; Act 2, 53m; Act 3, 1h01m. Live performance. Recorded on Good Friday, 15 April 1938. Broadcast direct on station WJZ. Metropolitan Chorus and Orchestra, cond. Arthur Bodansky (acts 1 and 3), Erich Leinsdorf (act 2). Issued on LP: The Golden Age of Opera, EJS 484, 1969. Issued on CD: Myto 3CD 982.H013 3. Notes: This is the only known recording of Parsifal with Flagstad and Melchior together, and the only recording of a performance in which Melchior sang the part without cuts. It also gives us a chance to hear the dark, deep voice of Emanuel List as Gurnemanz. This recording is, however, a necessary acquisition of the obsessive collector only. So little of the performance is discernible through the noise and distortion that as an aesthetic experience, listening to these discs leaves much to be desired and even more to the imagination. On first listening to its beginning, it is possible to imagine that one is listening to a herd of elephants stampeding, in a field covered in crumpled aluminium-foil, during a hailstorm. In the distance, muffled, an orchestra can be heard; the ear of faith can discern the prelude to Parsifal. Although the sound quality improves, there are still passages in this act and the subsequent acts in which, while it is possible to hear someone singing, what they might be singing and who the singer might be, is difficult to tell. There is a break of 10 to 30 seconds every seven minutes, when the acetate discs of the original were changed during off-air recording. Some of these breaks occur at unfortunate points, such that we lose for example Titurel's "Mein Sohn Amfortas, bist du am Amt? ", the second and third lines of "Ich sah das Kind" and Parsifal's declaration that he will become the Grail King. These breaks (despite the performance being, it was claimed, note-complete), result in a recording that fits on three CD's. Issued on CD: Myto 4MCD 954.136, 1995. Notes: Moralt's conducting and the feeble playing of the VSO do not commend this recording. The singing is mostly good, although Treptow sometimes sounds like he is being strangled. Bonus tracks: Act I of Die Walküre. Approximate timings: 4h01m in total. Cologne Opera, cond. Richard Kraus. Issued on CD: Gebhart JGCD12, 2000. Notes: Martha Mödl's first appearance in the rôle of Kundry, and very impressive she is too. The sound quality is very good for a historical recording. Unfortunately there is what sounds like a bad edit early on side 2. Live performance. Recorded 20 November 1950, Rome. Notes: Sung in Italian and heavily cut. Maria Callas contributes a lyrical but dispassionate and detached interpretation of Kundry, which suggests that she was unable either to identify with or to understand this character. Approximate timings: Act 1 (deep cuts), 1h32m; Act 2 (some cuts), 54m; Act 3 (some cuts), 1h06m. Live performances. Recorded July-August 1951, Bayreuth Festspielhaus. Notes: Windgassen is a credible Parsifal and Weber is a highly (some might say, too highly) dramatic Gurnemanz. Mödl is an unsteady but committed Kundry in this performance, having some difficulties with her pitch, and not up to the standard of her recorded 1949 or 1953 performances. Compared against later Bayreuth recordings, the string sound is a little thin, and the chorus are not always together. There is significant stage noise and occasionally audience noise too. Approximate timings: Act 1, 1h56m; Act 2, 1h10m; Act 3, 1h21m. Live performance. Recorded 1952, Bayreuth Festspielhaus. Issued on CD: Archipel ARPCD 0112-4, 2003; Andromeda ANDRCD5161, 2014. Notes:Like most of the live performances available on record with Kna conducting the Bayreuth artists, this recording is presumably taken from a live broadcast from the Festival. The singers are in general on better form than they had been in 1951 -- the cast is almost identical -- and the chorus is significantly more confident and accurate. The orchestra plays even better than they did in 1951. Approximate timings: Act 1, 1h52m; Act 2, 1h10m; Act 3, 1h19m. Live performance. Recorded July-August 1953, Bayreuth Festspielhaus. Approximate timings: Act 1, 1h39m; Act 2, 56m; Act 3, 1h09m. Live performance. Recorded 26 March 1954, Opéra Garnier. Orchestra of the Paris Opéra, Württemberg State Opera Chorus, Stuttgart. cond. Ferdinand Leitner, chorus director Heinz Mende. Issued on CD: Profil PH09009. Approximate timings: 3h59m in total. Live performance. Broadcast direct on station WABC on 17 April 1954. Issued on LP: Melodram MEL 442(4), 1984. Issued on CD: Adonis 54001, 1998. Notes:An interesting performance with a strong cast. Hans Hotter is heard here in his prime, and Astrid Varnay is a strong and convincing Kundry. The other principals are not quite up to their level of excellence. There is a lyrical quality to the singing of minor roles, in distinct contrast to the more dramatic style that can be heard in recorded European performances of the same work in the same period. Fritz Stiedry's conducting is rather eccentric, with some passages taken so fast that the singers can hardly get the words out. There is a strange cut in Gurnemanz's narrative, after "uns'res König's Hut", down to "Vor dem verwais'ten Heiligtum". Perhaps the management thought that the audience would find out about Klingsor and his Flower maidens eventually, so why spoil the surprise by letting Gurnemanz tell us in advance? Approximate timings (some cuts): Act 1, 1h42m; Act 2, 1h02m; Act 3, 1h09m. Live performance. Recorded July-August 1954, Bayreuth Festspielhaus. Issued on CD: King Records 7 Seas KICC 2341/4, Golden Melodram GM 1.0053. Approximate timings: Act 1, 1h50m; Act 2, 1h11m; Act 3, 1h22m. Live performance. Recorded 29 March 1956, RAI. Issued on CD: Living Stage LS4035169, 2003. Approximate timings: 3h57m in total. Live performance. Recorded July-August 1956, Bayreuth Festspielhaus. Approximate timings: Act 1, 1h50m; Act 2, 1h8m; Act 3, 1h18m. Live performance. Recorded July-August 1957, Bayreuth Festspielhaus. Approximate timings: Act 1, 1h51m; Act 2, 1h6m; Act 3, 1h17m. Live performance. Recorded July-August 1958, Bayreuth Festspielhaus. Issued on LP: Melodram MEL 583, 1981. Issued on CD: Golden Melodram GM 1.0058. Approximate timings: Act 1, 1h46m; Act 2, 1h09m; Act 3, 1h13m. Live performance. Recorded 7 August 1959, Bayreuth Festspielhaus. Notes:Noteworthy for a powerful interpretation of Amfortas from Eberhard Wächter. Approximate timings: Act 1, 1h46m; Act 2, 1h08m; Act 3, 1h14m. Live performance. Recorded July-August 1960, Bayreuth Festspielhaus. Issued on CD: Gala ?? ?, 2000. Live performance. Recorded 1960, Milan. Issued on LP: Melodram MEL 437, 1984. Approximate timings: 3h52m in total. Live performance. Recorded Vienna, 1 April 1961. Issued on CD: Hunt/Arkadia KAR 219, 1990; Opera D'Oro 1998; RCA 74321-61950-2, 1999. Notes: This recording seems to be missing part of the first scene of this performance, for which an extract from another recording has been substituted. In this extract, possibly taken from a Bayreuth performance under Knappertsbusch, the voice of Gurnemanz appears to be that of Jerome Hines and that of Kundry is probably Martha Mödl. Karajan's tempi are brisk. The recording has a strong "feel" of live performance, with a live acoustic; the temple choruses and Titurel sound distant. Otherwise the singers seem to have been closely miked. The orchestral balance is uneven, apparently due to the poor placing of too few microphones, and some of the woodwind instruments are almost inaudible. Karajan seems to have concentrated on beauty of sound, both from the orchestra and the singers. Even in passages where a more dramatic style would be normal, the singing is consistently lyrical. The strings seem to slide between notes rather more than is usual. For reasons that have not been fully explained, but apparently by Karajan's decision (this production was under his complete control), the role of Kundry was taken by two singers. Elizabeth Höngren played the wild Kundry and the penitent Kundry; but the seductress was played by Christa Ludwig. In the long scene between Kundry and Parsifal, Ludwig gives an outstanding performance, and, unusually, all of the necessary tension of this scene is evident. Approximate timings: Act 1, 1h41m; Act 2, 1h4m; Act 3, 1h11m. Live performances. Recorded July-August 1961, Bayreuth Festspielhaus. Live performances. Recorded July-August 1962, Bayreuth Festspielhaus. Issued on CD: Philips 416 390-2, reissued as 464 756-2. Notes: although Hans Hotter was past his prime, this is a very fine performance of the work and highly recommended. It is the only stereo recording among the many recordings from live performances of Parsifal at the Bayreuth Festival. This recording and the 1951 recording described above are the only "commercial" recordings among them and generally of better technical quality than those originating in radio broadcasts. Approximate timings: Act 1, 1h47m; Act 2, 1h9m; Act 3, 1h13m. Live performance. Recorded 24 July 1963, Bayreuth Festspielhaus. Issued on CD: Golden Melodram GM-10034, 1999. Live performance. Recorded 13 August 1964, Bayreuth Festspielhaus. Issued on CD: Hunt LSMH 34051, 1990; Golden Melodram 1.0004, 1998. Notes: the 55th and last performance of Parsifal conducted by Kna at Bayreuth. Live performances. Recorded July-August 1965, Bayreuth Festspielhaus. Notes: Available from operadepot.com: please note that the sound quality is not always good. In particular the third act seems to have been taken from a damaged tape. Jess Thomas is splendidly heroic, the star of this performance. Astrid Varnay is not on top vocal form and Hans Hotter is definitely past his best years. The mens' chorus tend to shout. Approximate timings: Act 1, 1h47m; Act 2, 1h7m; Act 3, 1h13m. Live performances. Recorded July-August 1966, Bayreuth Festspielhaus. Notes: A recording in good mono sound from a performance in which Boulez takes rather more relaxed tempi than in the 1970 recording (see below). Konya is a convincing Parsifal and Stewart a suitably agonized Amfortas. The weakest link here is Josef Greindl, who barks his way through the role of Gurnemanz. Unfortunately Astrid Varnay is past her prime here, with a tendency to shriek. Approximate timings: Act 1, 1h39m; Act 2, 1h01m; Act 3, 1h09m. Live performances. Recorded July-August 1967, Bayreuth Festspielhaus. Approximate timings: Act 1; Act 2; Act 3. Live performances. Recorded July-August 1968, Bayreuth Festspielhaus. Live performances. Recorded July-August 1969, Bayreuth Festspielhaus. Live performance. Recorded 24 October 1969, Teatro Colón. Notes: issued on CD by Living Stage, LS 1043, 2003. Approximate timings: (presumably cut) 3h28m. Issued on CD: Myto 063.328, 2006. Approximate timings: 3h48m in total. 1970. Teatro La Fenice, Venice. Live performance. Recorded 16 April 1970, Venice. Issued on CD: Mondo Musica MFOH 10411, 1999. Notes: Why this has been issued is a mystery. Although the principal singers are adequate, Heinz Wallberg seems to be out of his depth in the score of Parsifal. He conducts most of the music quite fast, except for the prelude to the second act, which plods along at andante. The orchestra and singers must have had some difficulty following his beat, since the strings are sometimes out of step with the brass and the singers are often out of step with both. Both orchestra and chorus sound under-rehearsed. The mens chorus provide some vigorous singing in the temple scenes that suggests (perhaps not inappropriately) a rugby team after a hard game. The strangest thing about this recording is that the choruses in both the first act and the third act are sung in Italian even though the soloists sing in German. The score has been disfigured by deep cuts. These include: in the first act, Gurnemanz's lines are cut from Drum blieb es dem ... down to the end of his narration, the next line being that of the squire, Vor allem nun: der Speer kehr uns zurück! ; then, after the swan is brought on, from Sein Weibchen zu suchen ... down to Parsifal breaking his bow. Towards the end of the second act, Kundry's lines are cut from Nun such' ich ihn ... down to aus der ich büssend kaum erwacht ; then the exchange with Parsifal from Kundry's Nie -- sollst du ihn finden! down to Parsifal's Vergeh', unseliges Weib! , so that the next line sung is Kundry's Hilfe! Hilfe! ; then her lines are omitted from Und flöhest du von hier ... down to so verwünsch' ich sie dir . In the third act, there is an enormous cut in Gurnemanz's part, from Ach, sie bedarf des Heiles ... , omitting Parsifal's cry of guilt, down to Nicht so! , resuming at Die heil'ge Quelle selbst . Thus Parsifal is never told that Titurel has died! These cuts, together with the fast tempi, shorten the music enough to fit on three CD's. Despite the date given on the box, this recording seems to have been compiled from more than one performance, or at least more than one tape, since there are some clumsy edits (for example at so segne ich dein Haupt in act three). Therefore it seems hard to understand that some of the rougher patches of orchestral playing were included in the master, such as the wrong entry of a brass player (no doubt confused by the cuts) just before this at so sei er fleckenrein . The placement of microphones does not seem to have been given much thought; generally the orchestra is too loud in relation to the singers, and when the latter are upstage they are faint; the offstage choruses are barely audible and the voice from above can hardly be heard. The sound of the coughing audience, however, has been faithfully recorded. Approximate timings: (deep cuts) 3h14m in total. Live performances. Recorded July-August 1970, Bayreuth Festspielhaus. Notes: The work is ruined by a misguided conductor who takes many passages much too fast, thus shortening each act by ten minutes, and by the shrieking of Gwyneth Jones. Approximate timings: Act 1, 1h34m; Act 2, 59m; Act 3, 1h06m. 1971. ROH Covent Garden, London. Live recording. Recorded and broadcast on 8 May 1971. Notes: Although it records what was in some respects less than a great performance, this is an important historical document from Covent Garden in the Solti era. There is some great singing -- Vickers alone justifies buying this set, McIntyre and Hendrikx are excellent, Bailey and Shuard very good, and the flower maidens are delightful -- but the performance is spoiled in places by quite inadequate playing in the pit. One does not have to listen to more than half of the first act prelude to realise that this was not a good night for the brass section, who continue to play out of tune for most of the first act. On the other hand, there is some fine playing from soloists in the woodwind section. Of the bells, perhaps the less said the better. Goodall was on this occasion as on many others tediously slow, taking nearly half an hour longer to deliver a performance than did Solti. This does not seem to matter in the outer acts but there are places in the second act -- slower even than those conducted by Toscanini in Bayreuth -- where I find myself thinking, "for goodness sake get a move on, Reggie!". Approximate timings: Act 1, 1h59m; Act 2, 1h18m; Act 3, 1h26m. Live performances. Recorded July-August 1971, Bayreuth Festspielhaus. cond. Eugen Jochum, chorus master Wilhelm Pitz. Issued on CD: Golden Melodram, 2003. Studio recording. 7-17 December 1971 and 15-25 March 1972, Sofiensaal. Notes: a remarkable feature of Kollo's interpretation is the drained, bleached tone he employs during the Good Friday scene in the last act. Although unattractive, it conveys the weariness and exhaustion of Parsifal, after ten years of wandering. This recording features a strong cast, also in minor roles; the flower maidens included Lucia Popp, Anne Howells and Kiri te Kanawa. Approximate timings: Act 1, 1h51m; Act 2, 1h11m; Act 3, 1h18m. Live performances. Recorded July-August 1972, Bayreuth Festspielhaus. Live performance. Recorded from a concert performance on 11 January 1975. Leipzig Radio Chorus, Berlin Radio Chorus, St. Thomas' Choir, Leipzig, Leipzig Radio Symphony Orchestra, cond. Herbert Kegel. Issued on LP: Eterna 8 27 031-035, 1975. Notes: Some reviewers have advised that this recording should be avoided. There are some people who like it, however, and if you like Kollo -- heard here in his brief prime -- then it might be worth a try. But it cannot be recommended as a first, or even as a second, recording. Brisk. Approximate timings: Act 1, 1h35m; Act 2, 1h00m; Act 3, 1h06m. Live performance. Recorded at L'Opéra de Paris on 18 April 1976. Choeur et Orchestre de l'Opéra de Paris; cond. Horst Stein. Recording: Available in good quality sound and MP3 format from operadepot.com . Notes: Anyone looking for a recording of this opera with Jon Vickers on the top of his form need look no further. Mezzo Nadine Denize delivers a superb interpretation of Kundry. Horst Stein's conducting is competent and the orchestral playing is excellent. Approximate timings: Act 1, ; Act 2, ; Act 3, . Live performance. Recorded at Oper Frankfurt on 23 May 1976. Orchestra and Choir of Oper Frankfurt; cond. Horst Stein. Recording: Available from operadepot.com . Live performances. Recorded July-August 1976, Bayreuth Festspielhaus. and 1 July 1980, Berlin Philharmonic Hall. Issued on LP: Deutsche Grammophon 2741 002, 1981. Issued on CD: Deutsche Grammophon 413 347-2, 1984. Notes: Hofmann's voice already shows signs of its imminent decline. Vejzovic is wobbly throughout. As compensation, Kurt Moll is a fine Gurnemanz and van Dam is probably the best Amfortas on record. Karajan allows the orchestra to get rather too loud, relative to the singers, in some passages, such as the flower maidens scene. As we can also hear in the earlier, live recording from Vienna, Karajan concentrated on the beauty of this music, at the expense of the drama. Approximate timings: Act 1, 1h50m; Act 2, 1h9m; Act 3, 1h18m. Digital studio recording, Munich, 1980. Notes: This recently issued recording allows us to hear a remarkable performance in excellent sound. It is one of the best recordings of Parsifal issued to date. In gratitude to Arts Archives, I shall overlook the fact that the illustration that ends the first act of the libretto, in their CD booklet, was stolen from this web-site! Approximate timings: Act 1, 1h52m; Act 2, 1h7m; Act 3, 1h16m. Palais de Congrès à Monte-Carlo. Issued on LP: Erato NUM 750105, 1982. Issued on CD: Erato 2292-45662-2, 1990. Issued on Videocassette: PAL/VHS ART 0P1. Notes: although recorded for the soundtrack of the film by Hans Jürgen Syberberg, this recording is a remarkable achievement in its own right. Jordan gives a conservative and well-balanced interpretation of the music and the playing of the Monte-Carlo orchestra is acceptable. To this author at least, Armin Jordan's tempi feel right. Approximate timings: Act 1, 1h45m; Act 2, 1h7m; Act 3, 1h13m. Live performance. Recorded July-August 1981, Bayreuth Festspielhaus. Chorus and Orchestra of the Bayreuth Festival, cond. Horst Stein. Issued on Videocassette: PAL/VHS 070 410; NTSC/VHS 070 510-3, 1991. Notes: Horst Stein's conducting is pedestrian. Jerusalem is in superb voice, but Randova disappoints. Orchestre national de France, cond. Marek Janowski. Notes: A broadcast of an abridged performance given in the Parsifal centenary year. Live performance. Recorded and broadcast on 13 February 1983, Budapest. Issued on LP: Hungaroton SLPX 12784-88, 1985. Recorded 17 to 25 June 1984 in Brangwyn Hall. Issued on CD: EMI CDS7 4912-8, 1988. Notes: Warren Ellsworth was, at the time this recording was made, lacking in the upper register, although in later performances at ENO and Covent Garden he gave a better account of the rôle. Goodall's tempi were notoriously slow. In this recording, the second act is unreasonably slow; it drags. The outer movements, however, seem to benefit from the broad tempi. Every detail is laid bare, and we can hear instruments (such as the harps at the very end of the work) where they are not heard in other recordings, and melodic lines that are usually lost in orchestral texture. An ideal recording for anyone who wants to study the music with the score in front of them. Approximate timings: Act 1, 1h57m; Act 2, 1h23m; Act 3, 1h26m. Live performances. Recorded July-August 1985, Bayreuth Festspielhaus. Issued on CD: Philips 416 842-2, 1987. Notes: Soon after this recording, Hofmann redirected his career into that of a rock star. Simon Estes is an insipid Amfortas. The star of these performances was Waltraud Meier, whose intelligent penetration into the predicament of Kundry is an unprecedented achievement. But even Meier is not heard here at her best -- compare the Barenboim/Berlin recording listed below. Levine's tempi are close to those of Goodall in the outer acts, slightly less glacial in the second act. Levine does not bring out the detail of Wagner's orchestration as Goodall did, and for which we can forgive the latter his slow tempi -- Levine seems to be wallowing in, rather than illuminating, this music. He manages to make the second act as exciting as watching paint dry. Recommended for insomniacs only. Approximate timings: Act 1, 1h59m; Act 2, 1h15m; Act 3, 1h24m. Studio recording. Recorded December 1989 - March 1990, Jesus-Christus- Kirche. Issued on CD: Teldec 9031-74448-2, 1991. Notes: A first-class performance by a cast of distinguished Wagnerians. In particular, Waltraud Meier gives a highly intelligent interpretation of Kundry and is even better than she was on the earlier Goodall and Levine recordings. Siegfried Jerusalem is heard here while still in his prime. Once again, van Dam convincingly conveys the agony of Amfortas. Approximate timings: Act 1, 1h51m; Act 2, 1h8m; Act 3, 1h17m. Studio recording. Recorded April 1991 and June 1992, Manhattan Center. Issued on CD: Deutsche Grammophon 437 501-2. Notes: As with Maria Callas in the rôle of Kundry, Jessye Norman gives a lyrical interpretation that some might find lacking in drama. Domingo is in good form here and his much- criticised German is intelligible and acceptable. Levine's tempi are not quite as slow as in the live recording from Bayreuth, but still soporific. There is also a Metropolitan Opera video, conducted by Levine but with some changes of cast: Siegfried Jerusalem, Waltraud Meier, Bernd Weikl and Franz Mazura. Approximate timings: Act 1, 1h55m; Act 2, 1h12m; Act 3, 1h22m. Live recording. Recorded and broadcast on 9 February 1997. Rotterdam Philharmonic Orchestra and Chorus of De Nederlandse Opera, cond. Simon Rattle. Issued on CD-ROM: Opera Classics, 1999. Notes: Despite a tiresomely static and conceptually inane staging, this production was redeemed by a musical interpretation at least as great as any the author has experienced. Approximate timings: Act 1, 1h41m; Act 2, 1h6m; Act 3, 1h13m. Chorus and Orchestra of the Vienna State Opera, cond. Christian Thielemann. Issued on CD: Deutsche Grammophon, 2006. Approximate timings: 4h02m in total. Live recording of performances given between 5-13 June 2009 in the Concert Hall of the Mariinsky Theatre. Orchestra and chorus of the Mariinsky Theatre conducted by Valery Gergiev. Notes:As Gurnemanz, René Pape is everything a devotee of this opera could wish for. Up-and-coming heldentenor Gary Lehman is more than adequate in the title role, as those of us who have heard his interpretation of Tannhäuser had expected. I was overwhelmed by Violetta Urmana when I first heard her in the Amsterdam production (see above) and although she has now pushed up into soprano roles, she is still the best Kundry around at present (2009). This strong cast of principals is supported by an ensemble with a distinguished tradition of Wagner performances. Approximate timings: Act 1, 1h52m; Act 2, 1h7m; Act 3, 1h18m. Right: Wagner conducting at the Vienna Musikverein, 14 March 1875.